Upon arrival into Lima´s International Airport, you will be met by our representative who will transfer to your hotel. Our representative will assist you with check-in procedures and provide you with a detailed itinerary, vouchers covering all the services included in your tour and additional information on the organization of your Peru trip. You will also receive a contact information sheet with all the hotel details as well as our offices contact information for each city and a 24-hour emergency number. This is a guided visit of the Imperial City of Cusco, where we will visit the Main Plaza, which has been the scene of great historical events in Cusco; and the Cathedral, constructed of great slabs of red granite in the renaissance style, and thus contrasting with the baroque style silverwork which decorates the interior. We will then continue on to the Santo Domingo church, built upon the foundations of the Inca temple Koricancha, which was dedicated to Sun worship. Later, we will head to the city’s nearby ruins: the fortress of Sacsayhuaman, a magnificent example of Incan military power; Qenqo, a ritualistic site with subterranean galleries that form an underground maze; Puca Pucara, the red fortress; and finally Tambomachay, also known as the Incan Baths. among the town´s little streets and get a clear idea of what this military, religious and cultural center was like during the Inca Empire. Along the way we will enjoy the changing landscape as we travel from Andean highlands to the beginnings of the jungle (“eyebrow of the jungle”), before finally arriving at the town of Aguas Calientes. We will take an early bus, which will take us to the citadel of Machu Picchu, or Lost City of the Incas, which sits upon the summit bearing the same name, and is one of the most representative and recognized examples of Incan architecture. We will walk through the different areas of the city: the agriculture and urban zone, featuring temples and dwellings; and the Intihuatana, or sun dial, finely carved out of stone. When we finish exploring we are going to return to Aguas Calientes town. Morning at leisure without guide (No entrances included). Afternoon return to Ollanta station by Vistadome Train. 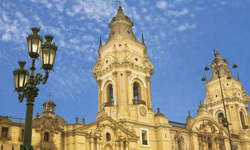 At proper time transfer to the airport for your flight from Cusco to Lima. Arrival in Lima and assistance with your international connecting flight. - Private transfers with local English speaking transferman and guides, except where otherwise specified. - Shared services with local English speaking guides as indicated in the itinerary, except where is not indicated as shared.